Caudalie Vine Body Butter //Like the Rituals body cream, I really liked this body butter but have others I need to finish first. Rituals Honey Touch Body Cream // There was a surprising amount of body cream in this sachet and I was able to spread it out to two uses. It smells amazing and kept my skin hydrated. I have a million and one other body lotions to go through first so I don’t need to buy any more soon. I will keep this in mind though for when I do need to buy a new one. Skin Pep Brightening Enzyme & Acid Peel x2 // I have very sensitive skin so although I have started to use a very mild acid exfoliator, this was a bit too strong for my skin. Skin Pep Dark Circle Eraser Growth Factor Eye Cream // Fortunately for me I don’t suffer with bad dark circles, nothing a good night’s sleep won’t cure anyway, so I don’t feel like I was able to use this properly and see any differences. Giovanni 2 Chic Ultra-Moist Deep Deep Moisture Hair Mask // I'm not even sure where you can buy Giovanni products as I think I got this sample along with the shampoo and conditioner in a beauty box. I did like this mask but not sure I'd buy the full size as it doesn't beat Philip Kingsley Elasticizer. Belnatur Regenerating Oxygenating Cream // Similarly to the other Belnatur sachets I’ve used up, this cream has quite a strong fragrance which irritates my skin too much. Belnatur Hydro-Nourishing Comfort Cream x3 // As I had three sachets of this moisturiser it gave me enough time to really know if I liked it or not. It was an okay face moisturiser, it kept my skin hydrated but didn’t stand out as anything special. What put me off this cream though is that it is highly fragranced which irritates my skin. Kiehl's Powerful-Strength Line-Reducing Concentrate // I feel like this product, along with a few others I’ve mentioned, have been a bit wasted on me as I’m only twenty-four and don’t feel like I need to use a product like this just yet. Instead I’m just trying to keep my skin hydrated and combat the sensitivity and eczema which in the long run should help with anti-aging. Dior Dream Skin Global Age-Defying Skincare Perfect Skin Creator // I’ve tried a couple of different skin care sachets from Dior and all of them have been highly fragrance which irritates my sensitive skin and this one was no different. This is one of those products that is a mix between skin care and make-up. Caudalie Nourishing Body Lotion x3 // I took these sachets away with me for a long weekend away in November as I was trying to make an effort to use up more sample sized products. 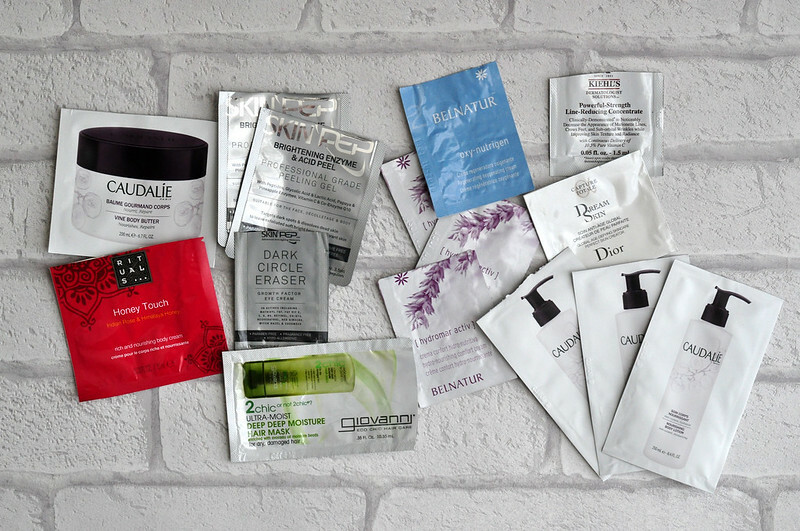 I got one full body application out of each sachet which is pretty good going for something I got for free. I liked that this had a lighter formula and I found it sunk into my skin pretty quickly. The only downside for me was that it has quite a strong scent which made it clash with other products I was using which I don’t really like. I currently have a million and one other body moisturisers to use first but I don’t think I’d spend the £20 to repurchase this even if it didn’t have a scent as there are cheaper and better products out there.